What used to be the old and dirty “bodega”, the area at the back of the church , has now been transformed into a clean and tidy storage area for the safekeeping of church paraphernalia used in liturgical events and activities. This room was left unfinished during the construction of the Nishizaka Hall which was used for various church activities. 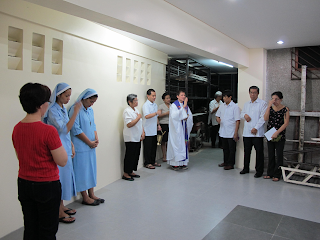 Designed and renovated through the personal efforts of Kuya Oca Calma, and managed by Ate Shirley Ruiz, the renovation was completed last February 2013. Named after Martha of Bethany, sister of Lazarus and Mary, who was “cumbered by so many things”, St. Martha’s workstation was blessed by Fr. Luke, together with some parishioners, after the 6:30PM mass last March 13.